The DIAGNOdent is a small portable high-tech decay detection device. It is easy to use and provides reliable diagnosis of subsurface and incipient ( early ) cavities. 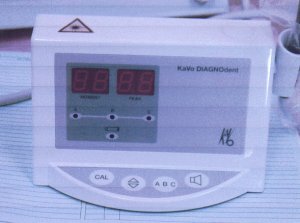 The Kavo DIAGNOdent is a light probe handpiece containing a one-milliwatt laser surrounded by a fluorescence detector which is attached to a control unit that filters, measures, and quantifies fluorescence, assigning a numerical readout of 0 - 99. Laser induced fluorescence is correlated with material in cavities and the scale readings correlate with depth and location of the cavity. Early caries detection - over 90% accurate. Regular examination using a sharp explorer and visual inspection alone is only about 35% accurate. Used in conjunction with visual inspection of surface characteristics, tactile sensation with a sharp explorer and the patients previous decay history, the DIAGNOdent gives us a very high level of confidence in the diagnosis of decay. Enables placement of pit and fissure sealants with confidence.